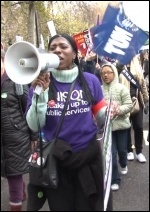 "The genie is out of the bottle"
Coming straight from the fantastic 30 November public sector strike demo, the mood at the packed-out London National Shop Stewards Network (NSSN) meeting was sky high after such a historic day, writes Paula Mitchell, London Socialist Party. Defend the JIB, victory to the sparks! 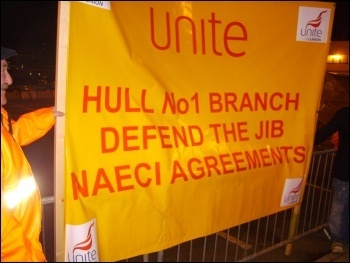 Electricians working for Balfour Beatty (BBES) have spoken for all electricians in the construction industry and voted overwhelmingly to strike to defend their national pay agreements - the Joint Industry Board (JIB), writes Rob Williams, Chair, National Shop Stewards Network. 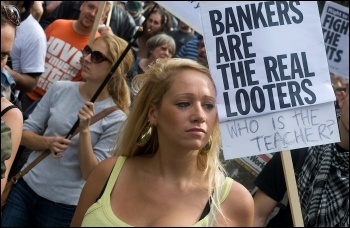 A Guardian/London School of Economics study has shown that Britain's summer 'riots' were fuelled by anger at injustice, the lack of money, jobs and opportunity, and how young people "felt they were treated compared with others", writes Suzanne Beishon, Youth Fight for Jobs. The day after N30, BBC's Question Time confirmed the need for a new mass party of the working class, writes Tony Mulhearn. Tamil Solidarity in Britain took the opportunity on Sunday to take stock of the campaign's progress and outline a plan for the year ahead, writes Manny Thain, Tamil Solidarity national secretary. 30 November strike: a historic day! Scotland enjoyed its warmest November on record and the UK's autumn was the second warmest since records began in 1910, the Met Office confirmed this week, writes Pete Mason. Homes Crisis: Fund housing need - not fat cat greed! 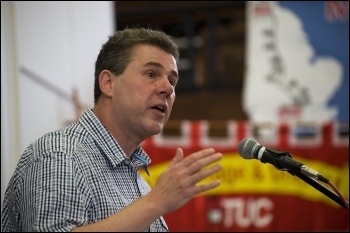 The Con-Dems have announced a 'housing strategy' that benefits big building companies and banks, including selling off more social housing stock and underwriting banks that offer 95% 'subprime' mortgages for newly built houses, writes Paul Kershaw, Unite LE 1111 housing workers' branch. 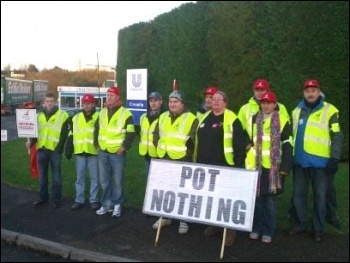 The south east region of the TUC recently showed a film about the Lucas Aerospace shop stewards' committee who, 35 years ago, produced a plan to make socially useful products instead of the weapons of mass destruction they made for their employer, writes Bill Mullins. 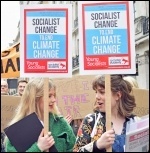 Unsurprisingly a doom-laden response has greeted Tory chancellor George Osborne's devastating attack in the autumn statement, writes Paula Mitchell, Socialist Party London secretary. See PCS press release: Block on pensions talks exposes ministers' hypocrisy. 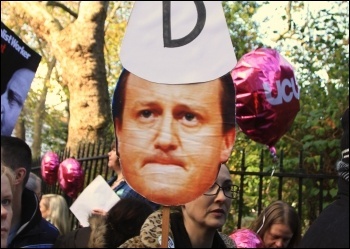 David Cameron was stoutly defending the 'nation'. This is what he claimed after he was humiliatingly defeated by 26 votes to one at the 9 December EU summit and withdrew from participating in discussions over a new EU treaty. 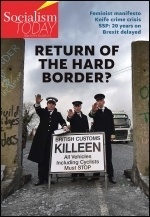 But which nation, asks Peter Taaffe, Socialist Party general secretary. 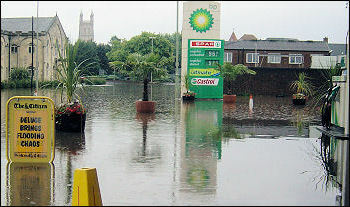 All out now to stop the sites! 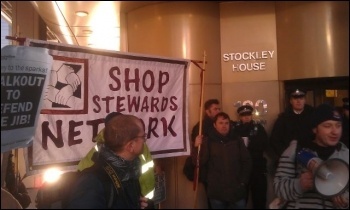 The construction workers' strike on 14 December could be the biggest strike in the construction industry for almost 40 years, writes Rob Williams, Chair, National Shop Stewards Network. Bullying has always been a problem in schools. 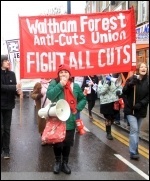 As the commercialisation of education accelerates, however, it is often the teachers on the receiving end - from senior management, writes Manny Thain, East London Socialist Party. 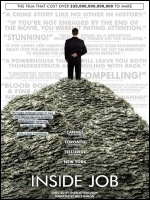 Public sector pensions - where now? 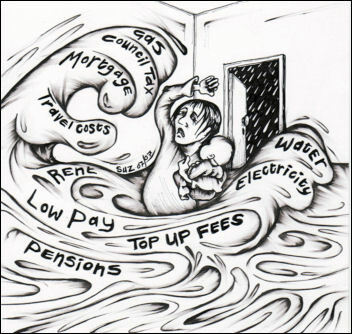 The high court ruled on 2 December that the government was entitled to switch the measure of inflation used for calculating pensions etc from the traditionally higher retail prices index (RPI) to the consumer prices index (CPI), writes Fran Heathcote, PCS DWP national organiser, personal capacity. Readers' comments: David Cameron recently announced plans to fast-track new drugs, making them available to patients more quickly, and before they have completed clinical trials, writes Paul Gerrard. 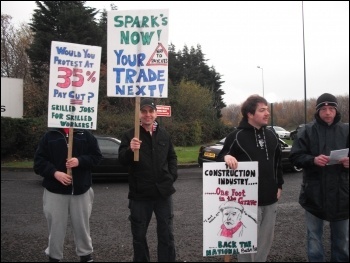 For years, many builders suspected that contractors operated a 'blacklist' of troublemakers to ensure they did not end up with any union activists on their sites, writes Dan Gillman. Kazakhstan - 20 years of authoritarianism! On 16 December 2011, the Republic of Kazakhstan celebrates 20 years as an independent state, a status it achieved as the Soviet Union collapsed, writes International day of solidarity action with workers' organisations. 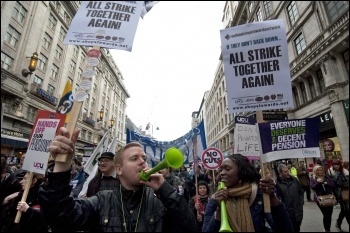 On 30 November around two million public sector workers took strike action in defence of their pensions and against cuts in public services. 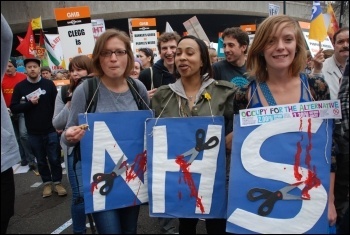 However, it is also urgent that the trade union and anti-cuts movement begins to discuss making sure it has an electoral voice, otherwise we are fighting with one hand tied behind our backs. "The supremacy of finance capital over all other forms of capital means the predominance of the rentier and of the financial oligarchy," wrote revolutionary leader Lenin in 1916 in Imperialism - the Highest Stage of Capitalism, writes Ken Douglas, Socialist Party national treasurer. Channel 4's campaigning series of programmes, The Great British Property Scandal, has struck a chord with a wide audience, writes Paul Kershaw, Unite LE 1111 housing workers' branch. When I addressed 2,000 striking public sector workers on 30 November in Reading, I brought greetings of solidarity and unity from the Thames Valley National Pensioners Convention (NPC), writes Terry Pearce, Thames Valley National Pensioners Convention (personal capacity). There is anger and disbelief in Dundee at the jailing of teenagers who were involved in joke Facebook pages 'organising riots', writes Matt Dobson, Socialist Party Scotland, Dundee. When is an agreement not an agreement? When it's an agreement to reach an agreement in the future, writes Pete Mason, East London Socialist Party. 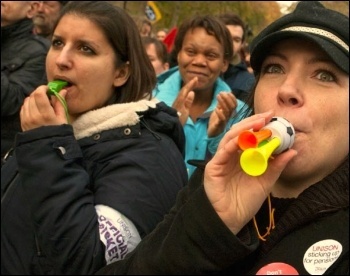 NUT, NASUWT and GMB members at Montgomery primary school in Birmingham took strike action on 13th December to protest against plans to turn the school into an academy, writes Nick Hart. No sell-out on pensions - Fight until we win! ipetition launched: Strike again in January! Defend our pensions! 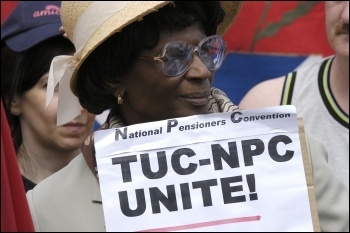 PCS denounces government's "unacceptable bullying"
The Cabinet Office unilaterally announced yesterday that the PCS civil servants union would no longer be invited to negotiations over pensions, writes See:. 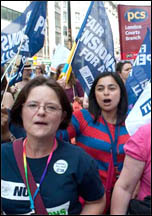 Defend public sector pensions - "action must be escalated"